OMG!! I have just taken an look at my blog to realize I haven’t blogged since May!!! Shame on me! Do you want to hear my excuse? Hey, it’s a new one! As I was updating one of my local advertisement on a wedding site, I came across another local stationer who had in fact copied in large parts my “Frequently Asked Questions Section” and it really made me not want to share anything anymore not to mention I was irate. I have contacted and become of a member of a company that protect people like me from copycats and I’m quite excited about it. I do think it’s sad when another company who is claiming to be a custom stationer just copies verbatim large parts from my FAQs. Who knows what else they are copying? Be original as you claim to be, come up with your own wording. Now, I’m over it and back to sharing good stuff with the loyal and new followers I have and I have lots of good stuff to share that I have been holding back. Jamie found me online and enjoyed reading my website and contacted me to create her wedding stationery. As lots of brides do, she wanted to start out with Save-the-dates. I’ve done lots of save-the-dates over the years but this was my first postcard save-the-date. I’ve got to give credit to Jamie who suggested it. It’s actually a great idea. No envelope necessary and the postal rate is cheaper. On the back of the postcard, she wanted to share an engagement photo with their guests and on the flip side we had all of the relevant information. As for the graphic, she wanted peaches. Though the couple resides in Georgia, most of their guests would be out-of-town guests. Not exactly what you would conjure up in your head as a destination wedding, but for the guests it is with the destination being Georgia. What better way to represent Georgia but with a peach! To top it off, she added a custom stamp which was another engagement photo in black and white of the couple. Will be sharing the invites I made for them soon!! Berta Morales - I think this was a great idea, brought to life in a magnificent way! Rawrr!! Dinosaur Invitations for a 3rd birthday Party! 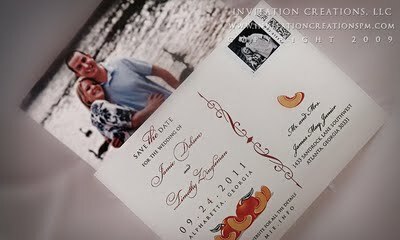 © 2019 Invitation Creations Blog|ProPhoto Photography Blogsite by NetRivet, Inc.